Anderson Creative is excited to invite you to this thought-provoking evening. 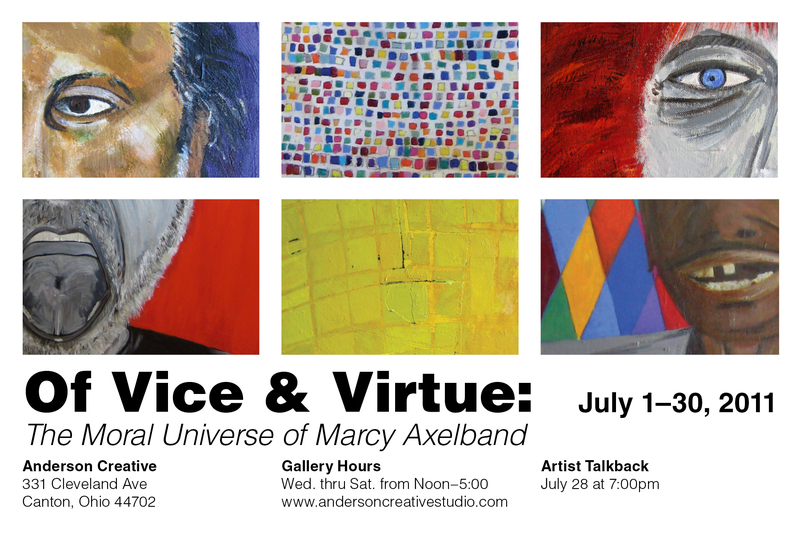 As the OF VICE AND VIRTUE exhibit enters its final week, we thought we’d take some time to chat with artist, Marcy Axelband, about her process as an artist, how the show came into existence, what it made her ponder about her own life and the lives of others. We’ll also have some time for attendees to ask questions and to share their own thoughts and responses to the pieces and themes in the show. Following, we’ll head over to the Conestoga for drinks and more informal conversation. Please join us this Thursday, July 28th, at 7PM, down at the gallery – 331 Cleveland Ave NW, Canton, OH 44702. Please RSVP directly to this e-mail if you plan on attending. This entry was posted in Art News, canton, exhibits, ohio, shows and tagged anderson, art news, canton, creative, exhibit, exhibition, gallery, ohio, show. Bookmark the permalink.